For the first time in nearly a decade, a Detroit automaker will exhibit at the Tokyo Motor Show. Jeep -- the best-selling U.S. brand in Japan -- will return when doors open in October. The Detroit 3 bailed on Japan's flagship auto show after the 2007 event and haven't come back since. They were part of a string of dropouts at the 2009 show, when the economy bottomed out. Jeep last graced the stage in 2007. This year, it will exhibit on the stand of FCA Japan, the local Fiat Chrysler subsidiary selling cars from Alfa Romeo, Fiat, Jeep, Chrysler and Abarth. FCA plans to show eight vehicles from four of its brands. Chrysler will be sidelined again. The return of Jeep signals rekindled interest in Japan by at least one of America's biggest names, even as Ford and General Motors still sit out. 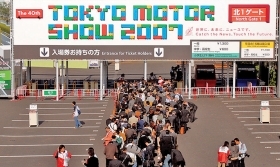 It is also a win for the Tokyo Motor Show, which has struggled to raise its profile amid competition from bigger shows in China.